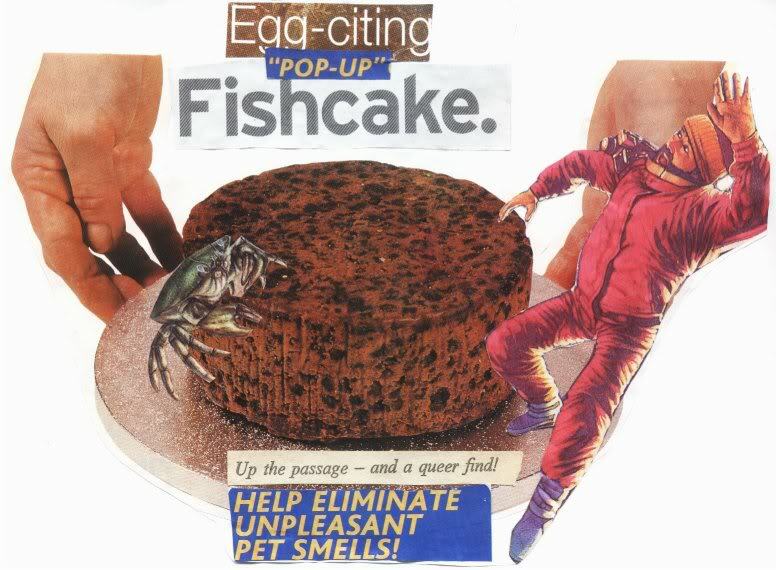 These are some silly collages I made 9-10 years ago for my friend Katie’s zine. 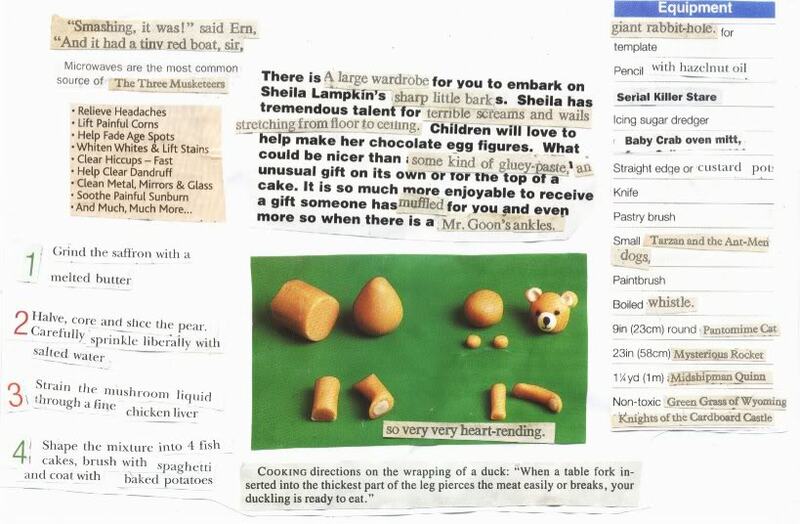 She found them recently and scanned all the bits. It’s a real gourmet recipe. Here’s a real cake recipe, because someone asked me the other day how I make icing. (Everyone seems to like my icing). I put it in the typical grrls zine last time, and a back issue of my own zine but I might as well put it here too. 1) Mix the sugar, margarine and vanilla together until they’re a nice fluffy cream. An electric mixer is very useful for this. 3) Sift the flour in and mix until the cake mix is a light fluffy paste, raising and lowering the whisks to add air to the mixture. You should only mix it for about 2 minutes max, overmixed cakes go claggy. If your mix is too thick, add a teaspoonful or two of milk or soya milk to dilute it. 4) Spoon the mix into cake cases and bake until golden and a skewer inserted into the centre of a cake comes out clean. 5) Leave to cool on a wire rack. 6) When cakes are cool, put the margarine into a bowl, and mix in the vanilla. 7) Add icing sugar two tablespoons at a time until the icing can’t physically absorb any more icing sugar. The icing mix will be a little too stiff for spreading. 8) Add a spoonful of milk or soya milk and mix to a smooth but thick consistency. 9) Spread icing on the cakes and leave to set.